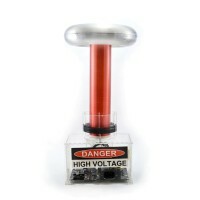 Ever dreamed of making a quarter million volts and sparks two feet long? How about using a MIDI keyboard to make a Tesla coil play music? You can do that all with this kit. 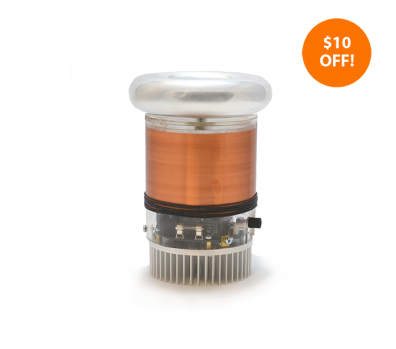 From resistors to power supplies, everything is included to get you beautiful singing sparks. Download the v1 user manual. Your DIY singing Tesla coil starts here. This baby doesn't only make a quarter million volts and shoots two-foot lightning, it also uses the sparks to play music! This kit already includes a printed manual and all the parts necessary for the the MIDI interrupter! There is no need to purchase the MIDI interrupter kit separately. It's recommended to get a set of extra IGBTs and UCCs, as these are the most common components that need to be replaced. DIY hobbyists will have the rewarding challenge of assembling a complex kit from scratch. Those curious about learning electronics will find a detailed guide from which to learn. High school students can have smashing science fair projects (just imagine what a hit a singing Tesla coil demo would be!). Audiophiles can experiment with plasma, the only truly omnidirectional source of sound. Musicians can play their MIDI tracks with an interesting new instrument. A 62-page, comb-bound instruction manual with detailed explanations and a step-by-step construction guide, printed in color. Maximum recorded spark length: 23"
Lead time for kit processing and packaging is ten business days. Domestic shipping & handling for this 7-lb box is a flat rate of $17.99. International shipping and handling is a flat rate of $59.99, or an additional $42. We ship via USPS; contact us if you would like us to use another shipping service. Who should build this kit? This kit is an advanced project - one sloppy solder joint could leave you with a smoking board (and trust us, burning electronics aren't pleasant). 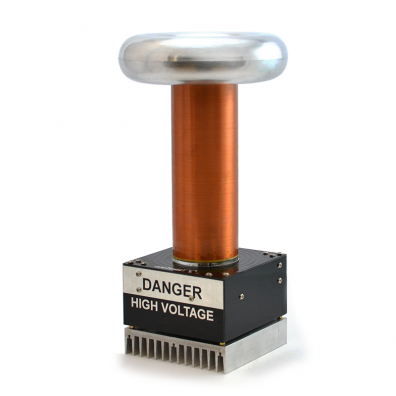 You should have prior experience with building and troubleshooting electronic kits to reliably construct a oneTesla coil. It's conceivable that a beginner can get a oneTesla kit to work, but it is STRONGLY ADVISABLE to have access to an experienced mentor who can provide advice and help troubleshoot. If you're under 18, you should build this kit under the supervision of an adult. While not strictly necessary, it's useful to have an oscilloscope for troubleshooting purposes. If you want to be even safer, invest in a Variac - a variable autotransformer that allows you to control the voltage input to the coil. What kind of equipment do I need to build the kit? You absolutely need a good soldering iron (you're making your life miserable with an iron that costs under $40, so don't even bother). You need common hand tools: a screwdriver, wire cutters, diagonal cutters, needlenose pliers, and a crimp tool (or large pliers). You need a glue gun or superglue. You should budget at least a full day, if not more, for construction. An oscilloscope is very helpful, as is a Variac. Also, we only provide US IEC cables. International customers will need to supply an adapter. If you run into problems during construction, testing or operation, we encourage you to ask for help on our support forum (onetesla.com/forum). If you make an error in soldering or damage your board during construction, we offer affordable sets of replacement parts. We have a replacement main control board set, a replacement silicon component set, and a replacement interrupter set. These sets are only available to former kit customers. If you are interested in a replacement set, write to replacements@onetesla.com with your previous order number (or Kickstarter username). Additionally, we highly recommend getting some extra IGBTs and UCC gate driver ICs, as they are the components most prone to failure, and it is useful to have spares on hand. What kind of MIDI device can I use with this coil? You can play a pre-recorded MIDI file from a computer using the USB-to-MIDI adapter that we include in the kit, or you can use a MIDI instrument such as a keyboard. The interrupter only reads the first track of the MIDI file, and can only play a maximum two notes at once.